Chunky beading and sequins rule on JVN55771! This mermaid is uniquely crafted with a scoop neck bodice encrusted in sequins and multiple sizes of beads in dress matching colors! The mermaid shaped skirt is formed by little bustles of tulle secured around the skirt, and the beading drifts down between the bustles for extra shine! An open racerback completes this dazzling look! 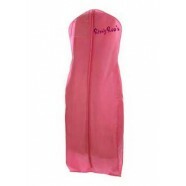 Rock it to your next prom, pageant, wedding, or formal ball!